To provide monetary assistance to persons entering or currently attending a college, university, trade school or other career opportunities that have additional educational or training requirements. The awards will be a one-time only award, but the awardee may reapply annually as long as he/she is a student in good standing ( a C grade or above or its equivalent). and prospective students from outside the UMC cluster churches mentioned above. Priority of awards will be given first to members and constituents of the Macon UMC, then to members and constituents of the Britton, Clinton, and Tecumseh UMCs, then to other members of the community. The amount to be dispersed and the number of awards may vary annually according to the decision of the Administrative Board. The factors to be considered include but are not limited to: the amount of earnings in the fund; the number of applicants; and the number of awards to be made. In general, it is anticipated that the awards will vary between $250.00 and $500.00. 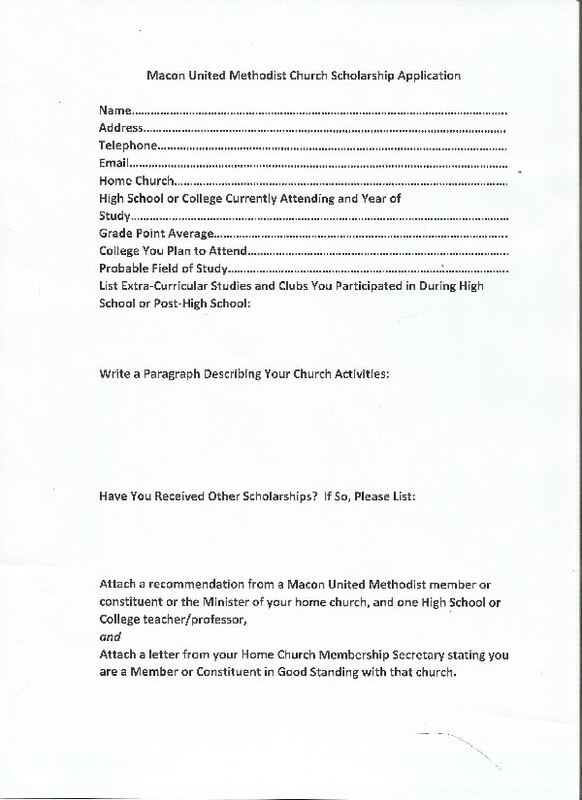 The required Application and Letter of Good Standing and any other documentation required for the application should be returned to the Macon UMC Pastor allowing a minimum of 1 month and a maximum of 6 months before the funds would be actually required. The MUMC Administrative Board or a subcommittee of its choosing will review the applications and determine the awardees and the amounts according to the above guidelines. The awards will be presented during a church service on a date that is convenient for the MUMC and the recipients. The awards will be in the form of a check presented to the recipient.